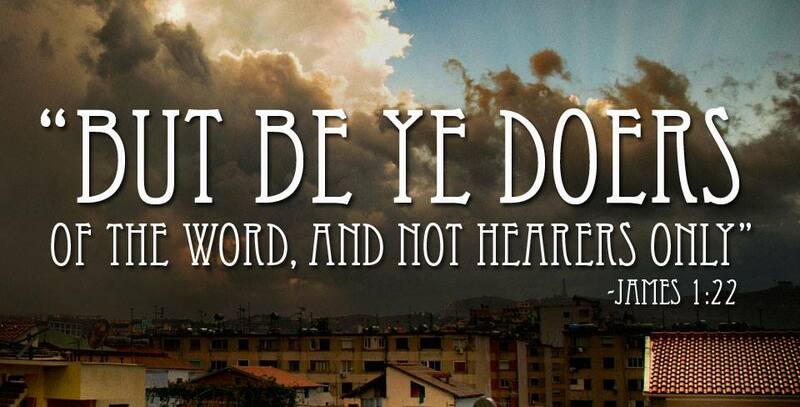 “But be ye doers of the Word, and not hearers only, deceiving your own selves. For if any be a hearer of the Word, and not a doer, he is like unto a man beholding his natural face in a glass: for he beholdeth himself, and goeth his way, and straightway forgetteth what manner of man he was. But whoso looketh into the perfect law of liberty, and continueth therein, he being not a forgetful hearer, but a doer of the work, this man shall be blessed in his deed” (James 1:22-25). It is not enough to hear the Word; we must do it. Many people have the mistaken idea that hearing a good sermon or Bible study is what makes them grow and get God’s blessing. It is not the hearing but thedoing that brings blessing. Too many Christians mark their Bibles, but their Bibles never mark them! If you think you are spiritual because you hear the Word, then you are only kidding yourself. The Word here is compared to a mirror. The main purpose for owning a mirror is to be able to see yourself and to make yourself look as clean and neat as possible. As we look into the mirror of God’s Word, we see ourselves as we really are. James mentions several mistakes people make as they look into God’s mirror. First, they merely glance at themselves. They do not carefully study themselves as they read the Word. Many sincere believers read a chapter of the Bible each day, but it is only a religious exercise and they fail to profit from it personally. Their conscience would bother them if they did not have their daily reading, when actually their conscience should bother them because they read the Word carelessly. A cursory reading of the Bible will never reveal our deepest needs. It is the difference between a candid photo and an X-ray. The second mistake is that they forget what they see. If they were looking deeply enough into their hearts, what they would see would be unforgettable! Think of how some in the Bible responded to the true knowledge of their own hearts. Isaiah cried, “Woe is me! for I am undone” (Isaiah 6:5). Peter cried, “Depart from me; for I am a sinful man, O Lord” (Luke 5:8). Job was the most righteous man on earth in his day, yet he confessed, “I abhor myself, and repent in dust and ashes” (Job 42:6). Mistake number three is: they fail to obey what the Word tells them to do. They think that hearing is the same as doing, and it is not. If we are to use God’s mirror profitably, then we must gaze into it carefully and with serious intent (James 1:25). No quick glances will do. We must examine our own hearts and lives in the light of God’s Word. This requires time, attention, and sincere devotion. Five minutes with God each day will never accomplish a deep spiritual examination. I have been fortunate with the doctors who have cared for me through the years, and I owe a great deal to them. Each of them has possessed two qualities that I have appreciated: they have spent time with me and have not been in a hurry, and they have always told me the truth. When Jesus, the Great Physician (Matthew 9:12), examines us, He uses His Word; and He wants us to give Him sufficient time to do the job well. Perhaps one reason we glance into the Word instead of gaze into the Word is that we are afraid of what we might see. After seeing ourselves, we must remember what we are and what God says, and we must do the Word. The blessing comes in the doing, not in the reading of the Word. Why does James call the Word of God “the perfect law of liberty” (James 1:25)? Because when we obey it, God sets us free. “And I will walk at liberty: for I seek Thy precepts” (Psalm 119:45). “Whosoever committeth sin is the servant of sin” (John 8:34). “If ye continue in My Word, then are ye My disciples indeed; and ye shall know the truth, and the truth shall make you free” (John 8:31,32). —Condensed from Be Mature by Warren Wiersbe.